able to get to know my princesses Jesie and Leah! hope you have a lovely easter holiday! Being picked up bright and early is always the sign of the start of carnival season! The ANZAC themed carnival was our first carnival as a court, and i must say we were off on a banger! As we arrived we saw our wonderful float decorated by the wonderful Debbie, Janine and Dave. They done an amazing job of incorporating our stunning dress colours into the float, a reason for winning first queens float!! Not only this, i also had the pleasure of winning queen of queens! this was an absolute honour as this was my first carnival as queen! I was ever so interested in the theme of this carnival as i had recently taken both of my GCSE history exams, and due to my large knowledge of ANZAC, the judges and i had a lot to talk about! During the procession, we were greeted by many familiar faces, such as last years queen Kerry-alice. Overall, Brightlingsea carnival was an extremely beautiful experience, one i shall cherish forever. Following our first successful carnival at brightlingsea, the girls and i were super excited to get to Great Bentley's carnival. Upon our arrival we were greeted by all of the courts that we had previously met at Brightlingsea carnival, they all looked absolutely stunning in their dresses. It was lovely seeing the Great Bentley court as it was lovely to see how optimistic they were, considering the dreary weather. As the procession started, we didn't allow the pouring rain to dampen our spirits! It was lovely to see that no matter how much the rain poured down all the courts still stayed on their floats. At the presentation of the awards, we were ecstatic to find out that our float had won 1st visiting float yet again, and i had won queen of queens! Of course our float is absolutely beautiful, but to win queen of queens yet again must be beginners luck! Thank you to Great bentley carnival comittee for giving us this oppurtunity, it was a fabulous day. xoxo teegan. 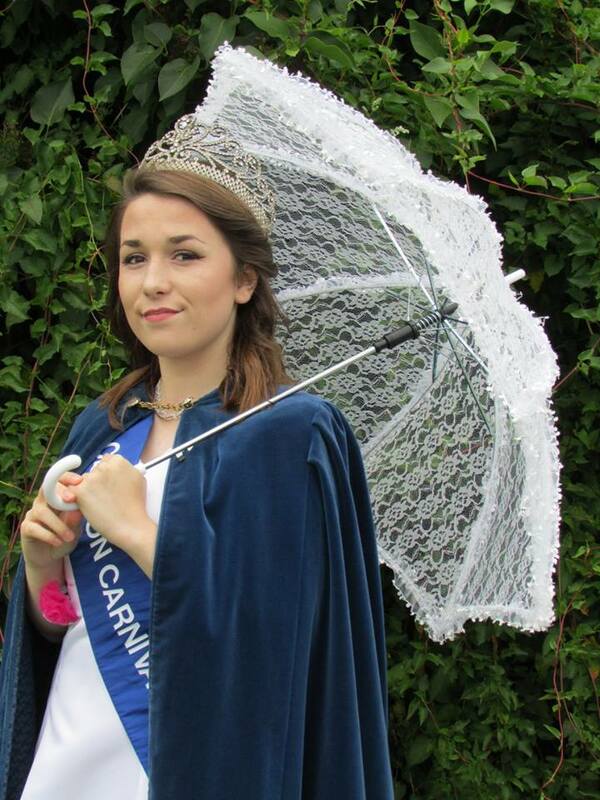 When I was carnival princess in 2014, I remember going to Witham's carnival and having a blast! This year we definitely weren't disappointed! We were picked up bright and early ready for our journey ahead. As we arrived to the rugby grounds we were greeted by a very familiar face to us all, Skip the town cryer! It was ever so lovely to see him again as it had been 2 years since I saw him last, so it was great to have a catch up with him. My beautiful princesses were graced with being crowned 2nd in Princess pairs and I was yet again crown queen of queens! I was absolutely shocked when I was handed the certificate, what an honour! I absolutely loved the procession and do did the girls! Everyone had an enthusiastic attitude that was truly passed from person to person. It was a lovely day, thank you Witham. xoxo teegan. Finally the highly anticipated day had arrived! I had woken up in such an amazing mood and ready for the busy day ahead. The girls and I arrived bright and early ready to be pampered; courtesy of the lovely ladies at Ultraviolet. After our barnets were intricately braided and curled, it was time for makeup! Leaving the salon, we were definitely ready to showcase ourselves to the people of Clacton. It was clear that luck was definitely on our side as we were blessed with beautifully warm weather! Upon arrival at the airfield, my two princesses and I were eager to chat to all of the other courts that we had bonded with over the summer. We then progressed to having a look at all of the floats involved in the procession, it was amazing to see how much work had been out into everything! It was definitely out of this world! After all the chatting and walking, the girls and I were in dire need of a lovely icecream! As the procession started to move, I grew even more excited as I saw the crowds of people. It was oh so heart warming to see how this event had pulled together our community. It was amazing to see so many familiar faces in the crowds down at the seafront. I even saw my baby cousin wave at me! As the procession drew to a close, we arrived at St Pauls church, and were presented with a beautiful tea fit for the monarchs! We were absolutely spoilt, and I would not have changed the day at all. I would like to thank everyone involved in the procession and the comittee, because without them, we wouldn't have had such a lovely day or even this oppurtunity to do such an amazing thing! From my time as princess, I strongly remember Walton carnival as a beautiful carnival filled with lots of fun activities! This years theme was Mardi Gras and we were definitely excited to get on with the day as we were informed that we were to be joined by Brightlingsea's court! It was so unfortunate that they were let down, but we were happy to step in as we all became such great friends over the summer. Today's carnivals festivities started off with a delicious tea, which definitely had filled us up to avoid rumbling tummies in the float! Although the sun was shining, it was a very brisk day, so Jenine and Debby had planned ahead! As soon as the words "I'm cold!" were mentioned, we were wrapped tightly in blankets and homemade duvets! The transition to a night carnival was lovely to see as this attracted many more people to the procession, which was lovely to see! At the end of the procession we all joined together in the square to be awarde our prizes if any were won. We were graced to be awarded with 1st Float! I was so pleased as Jenine, Debbie and Dave's hard work was being taken into consideration. A truly amazing end to a lovely day. Thank you walton! The girls and I had to be ready bright and early, ready to go to Sudbury! We were very excited as this was the first time that we had been to this procession, so it was highly anticipated for us all! As we arrived to Sudbury, our court and Witham were the only court there, which was terrible to see, but nevetheless it was a beautiful day! I was even greeted by an old face from my primary school days, which wass lovely! Despite Carol and Mandy being unable to attend the day, Jenine and Debbie done an amazing job in keeping us all in check! It was lovely to see the new Sudbury court as we had only met them once previously. At the end of the procession, we were gathered in the arena in preparation of receiving our awards. We were pleased to be presented with 2nd court of the day behind Witham. Over all it was a lovely day and we were very pleased with the outcome of it. This was another carnival which was highly anticipated as I had never been to this carnival before. It was lovely to see the Great Dunmow court again! Although it was a cold day, the excitement kept us warm! It was even an honour to chat with the newly appointed mayoress and her family, Leah and Jess were definitely interested in her Chain of Office. Before the procession, we were pleased to be presented with 1st visiting court, another blessing! The procession although long, was beautiful! I had now learnt that Great Dunmow is a very beautiful town! Thank you for giving us this oppurtunity! This was definitely a carnival that I was super excited about as this was a later night carnival, illuminated by so many lights and glowsticks! Before the procession we made our way down to the yacht club to meet with the other courts and the judges. It was lovely to meet the newly crowned Burnham court! As we all sat down, we were visited one by one by the judges which was definitely nerve wracking! After judging, the absolutely amazing food was brought out and it didn't take time for our bellies to be full to the brim! After we had a bite to eat was the time for the award presentation. I was even lucky enough to be awarded queen of queens! I was definitely shocked to win such a great award! After winning this, I was definitely buzzed to start the procession. It was absolutely lovely to see the brisk night lit up with all different types of twinkling lights. There was such a large turn out in burnham which was amazing to see as it ws even more beautiful illuminated at night! Thank you ever so much for giving me such an amazing oppurtunity, the girls and I thoroughly enjoyed it.